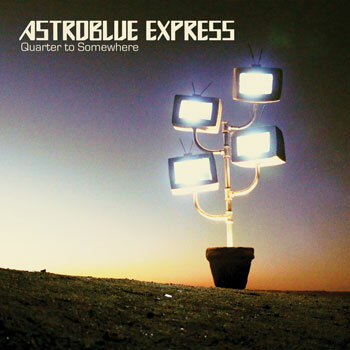 Astroblue Express’ Quarter to Somewhere begins with Calling On Alice, an ethereal track that blends together equal amounts of Bjork, White Town, and Massive Attack. The female vocals bring together ambient, goth, and indie rock styles in a way that we have never heard. Midnight Drifter allows the instrumental side of Astroblue Express to shine; the deliberate arrangement is what will draw listeners in here. When the vocals begin to increase in intensity, the resulting track becomes an early high-water mark for the band. It is during this effort that the production succeeds, making for a song that could easily garner radio airplay. You’ll Be Fine is a track in the middle of the disc that keeps things chugging well, as the dynamic between the much more human vocals and the picture-perfect atmosphere generated by the drums pushes each to a higher plateau. Find Your Motion is another must-listen because of the spontaneous feel of the song. The quick shifts through quicker and slower momentums makes for a track that will stand up to repeat spins, while the sweeping vocals are so beautiful that they will bounce around the minds and hearts of listeners long after Quarter to Somewhere ceases to play. Into The Beyond goes beyond the human/perfection dynamic in its inclusion of an electronic sound. This bit of electronic is a great shake-up in a regaion of an album where feel bands are trying to change the world. The piano that plays alongside the electronic line provides further complexity to an already deep and effecting composition. For more information about Astroblue Express, check out their domain; their SoundCloud profile (linked below) has samples of the music from Quarter to Somewhere.